Are you familiar with this wonderful thing? You need to be. I had never heard of it but stumbled upon a post on Serious Eats sometime last year and was intrigued. 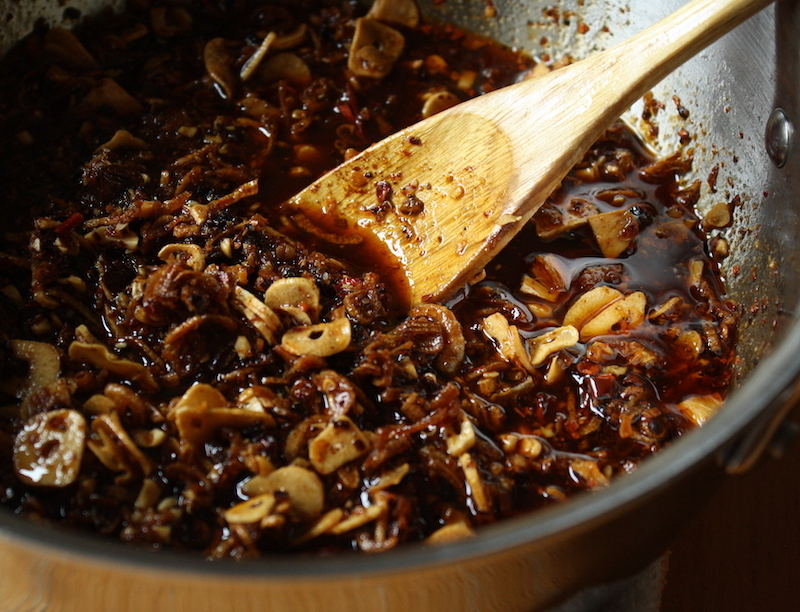 The SE recipe is a homemade take on the popular Laoganma’s Spicy Chili Crisp and it is crazy delicious and ridiculously addictive. Spicy, crunchy, savory, tingly, packed with umami … I’ve been eating it by the spoonful on just about everything. It’s based on something called málà sauce, a Sichuan chili-oil condiment made by simmering chilies, Sichuan peppercorns, and spices in oil. But then there’s the crunchy part – crispy shallots, garlic and peanuts. Oh my. A few months ago, I looked around my kitchen and the dried chilies I’d amassed from god knows where and decided to give it a try. I had everything except the peanut oil and MSG and that was quickly remedied with a trip to the Asian market. Then I started. Good lord. I’m going to be honest. This is a tedious recipe. It is not difficult but it takes a ton of prep time. The chilies have to be de-seeded, which if they’re small is a royal pain but you don’t want the seeds in the mix as they will impart a bitter flavor. Then the chilies have to be ground into nice chili flake size pieces. And I like to cut them into smaller pieces first so they grind evenly. OK, worth the trouble. The fresh ginger has to be cut into thin matchsticks. The peanuts have to be chopped. 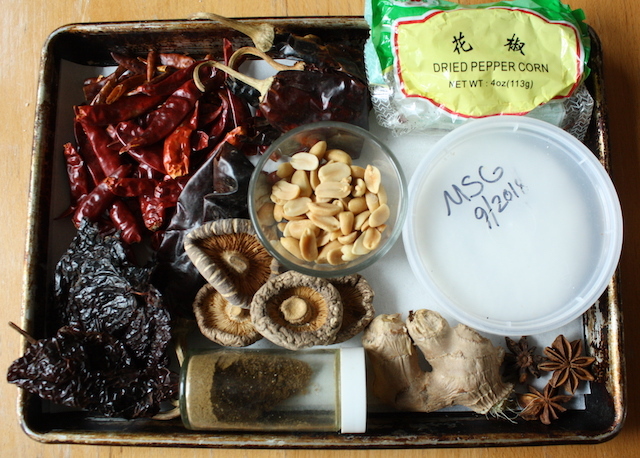 The Sichuan peppercorns and dried shiitakes have to be ground into powders. Do you have freshly ground cumin and black pepper? Do you have to run out and buy MSG, of all things? Because it really makes a difference. OK, worth the trouble. Do all these things and you will be rewarded with the most delicious, mouth-watering condiment that zips up damn near everything. I put it on and add it to all sorts of Asian-y noodle dishes, dump it on top of boiled dumplings and put spoonfuls into my ramen. The other day I had a bowl of basic buttered egg noodles with a good spoon of chili crisp and it was delicious. Absolutely worth the trouble. The thing to figure out is the mix of chilies. 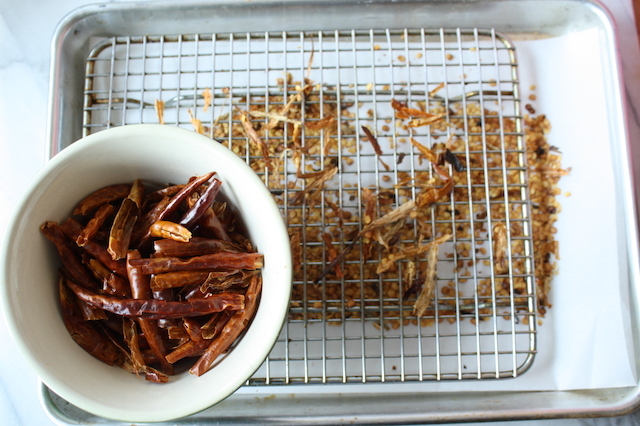 The original recipe calls for árbol, japones and kashmiri dried chilies. I was making this on a whim and used chilies I had on hand – árbol, ancho and guajillo. It was good – darkly colored, spicy but not overly so and super tasty. For my second batch, I followed the recipe. I found the árbol in my regular grocery store, the japones in a Hispanic market and the kashmiri in an Indian market. That was a bit too much running around and while very good, it was hella spicy. I actually preferred the less spicy version and have been making variations of that mix ever since. The latest batch may be my favorite yet. I was running low on árbol so I supplemented with japones since they have similar heat levels, substituted the called for japones with guajillo and the kashmiri with ancho chilies. Quite nice. 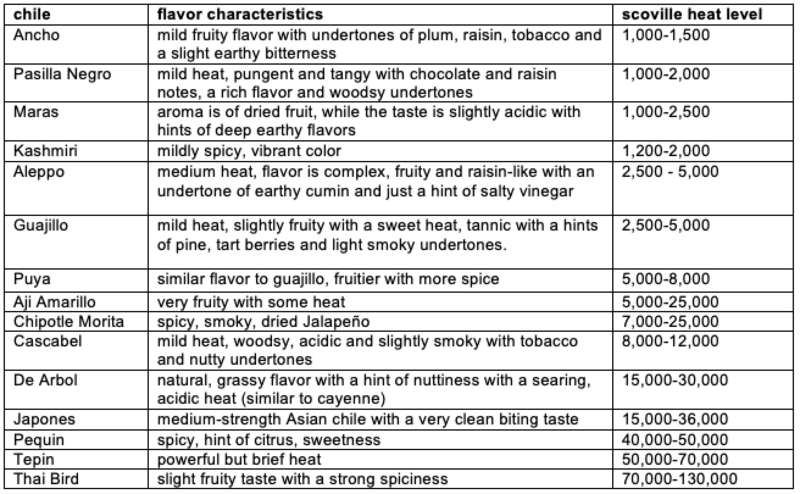 Below is a chart of various dried chilies, the flavor characteristics and the Scoville heat levels, an indicator of where various chilies lie in terms of spiciness. Use the recipe as a guideline and mix and match the chilies based on the flavors and heat levels you like. Note: tastecooking.com included a post on chili crisp in last weeks email blast with some good background on the stuff and a recipe for chili crisp peanut brittle I may have to try. Check it out here. STRESS THERAPY BAKING FACTOR: BURNS SO GOOD. Boy oh boy. This stuff is crazy good. Yes, it is tedious and time-consuming. And persnickedy. It’s just how it is but it is so worth it. Buy the chilies and round up all the ingredients, including the MSG. It adds something I can’t quite put my finger on … a savoriness that is fantastic. One big umani bomb, as they say. 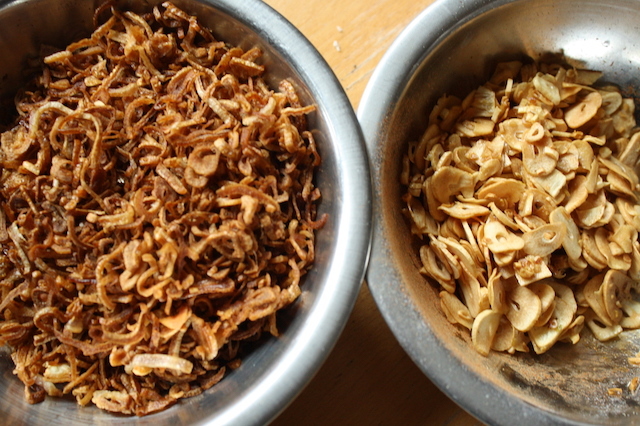 Here’s the thing with MSG: some people have severe reactions, much like other allergens. Here is an interesting article on the MSG reaction. If it’s an issue, leave it out but, if not, use it. That little addition, that little teaspoon, takes this stuff from good to great. Just use it. The chili mix in the original recipe is very spicy – play around and see what you like, using the chart above to sort out your spiciness levels. Chili crisp keeps for 3 months at room temperature. Enjoy with noodles, dumplings, ramen, rice or whatever. It is good on everything. A quick hint for cleaning out your spice grinder: run some cereal through to pick up all the miscellaneous bits of spices and chilies, dump then wipe out with a paper towel. I find a Chex cereal works quite well. Update: my friend Jenn made this with aleppo pepper and urfa biber flakes she purchased at a spice store. Not only is this a brilliant combination of flavors but the pre-ground chilies will save a boatload of time. For the chilies: Put on disposable latex gloves. Place a wire rack inside a quarter- or half-sheet tray. Using your hands and kitchen shears, cut open chilies and place them on rack. Shake rack to sift off most of the seeds. Cut the chilies into smaller pieces so they will grind evenly. Transfer chilies to a bowl and discard seeds. Using a spice grinder and working in batches, process chilies until they are ground to a size just larger than standard chili flakes. Transfer ground chilies to a pot large enough to accommodate bubbling oil (at least 4 quarts in size). 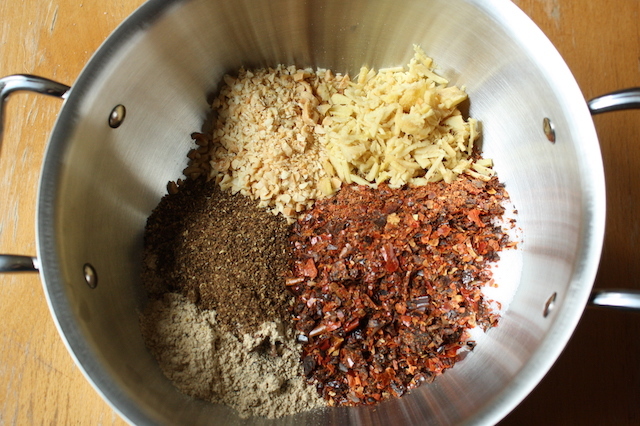 For the spices: to the chili flakes in the pot, add the spices/flavorings – chopped peanuts, ginger, black pepper, star anise, cardamom, ground cumin, ground Sichuan peppercorn, mushroom powder, salt, MSG (if using), and sugar. Set aside. For the shallots & garlic: Set a fine-mesh strainer over a 2-quart heatproof bowl. In a clean 4-quart saucepan, combine the oil and shallots. Cook over medium-high heat while constantly stirring. Keep an eye on them, they will start out slowly then go from golden to black in the blink of an eye. Once shallots become light golden brown, strain. Pour oil back into pot and add the garlic. Cook over medium-low heat, constantly stirring, until light golden brown, then strain. Set aside fried shallots and garlic. Return oil to the pot once more and heat to 375°F. Stir well to distribute hot oil throughout. Set aside to fully cool, about 30 minutes or until cool to the touch. Mix in the fried shallots and garlic. 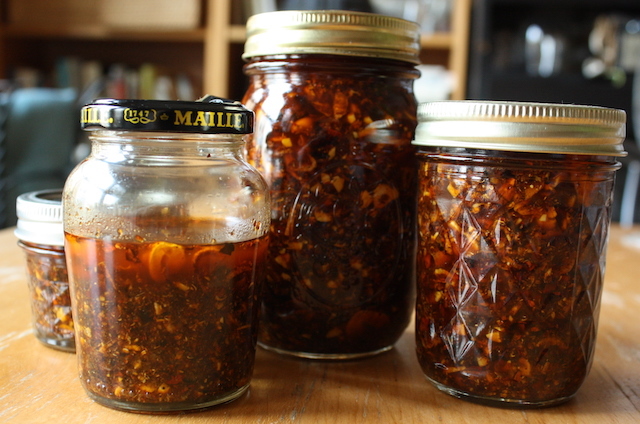 Pour/spoon the finished chili crisp into jars and store at room temperature for about 3 months. It can be served immediately, but for best flavor, eat it the next day. Stir well before serving.